This disc was auctioned in December 2004 and probably dates from December 1970. I have no more info than provided by the auction description. It can be assumed that this is the standard released mix. 1970. “John Lennon/Plastic Ono Band” was Lennon’s highly personal, introspective (and some say best) album. 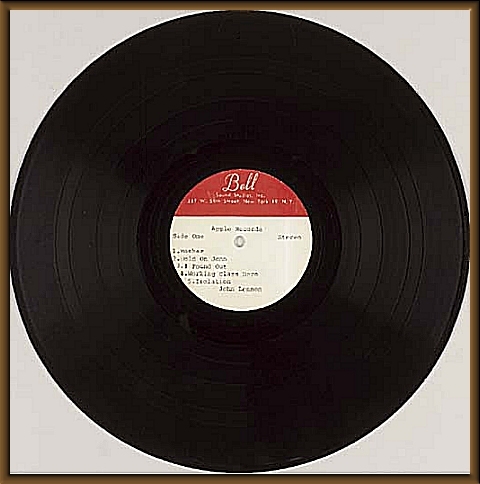 This undated metal acetate has Bell Sound Studios (New York) labels and appears to be the final released version of the album. A Bell Sound labeled acetate is probably almost as rare as an Apple Records labeled acetate and both are highly collectable. Included is a Bell Sound custom cover. Disc VG-, Cover M-. Provenance The Estate Of Sam Feldman. 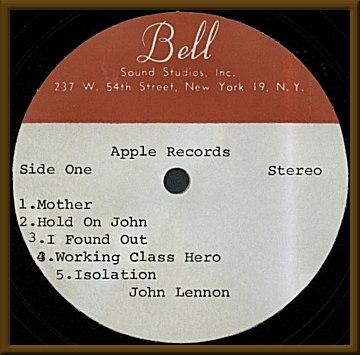 Recorded September - October 1970.